Tirupati is a major pilgrimage and cultural city in the Chittoor district of Andhra Pradesh. It is famous for the Venkateshwara Swamy temple, which is dedicated to God Venkateshwara. As one of the most important pilgrimage centers in the world, the temple draws about 100,000 to 200,000 pilgrims daily. 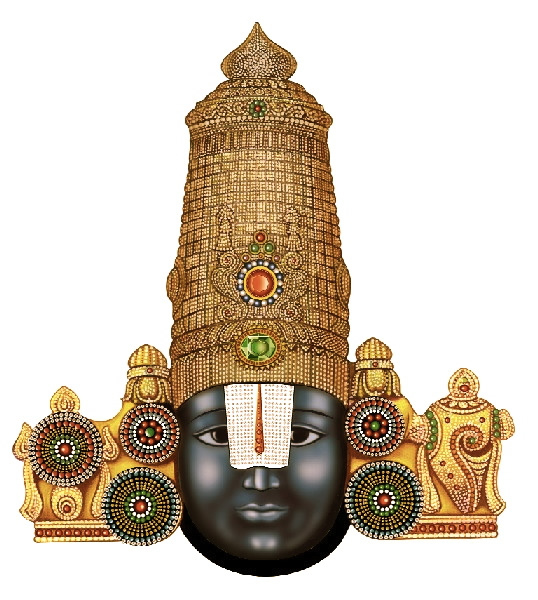 The Tirumala Sri Venkateshwara Temple is a famous Vedic temple in the hill town of Tirumala, near Tirupati. The temple is on the seventh peak, and is also known as the “Temple of Seven Hills”. The presiding deity of the temple is Lord Venkateshwara, an incarnation of Lord Vishnu, which is also known as: Balaji, Govinda, and Srinivasa. According to one legend, the temple has a murti – a statue – of Lord Venkateshwara, which is believed to remain there for the entire duration of the present Kali Yuga. 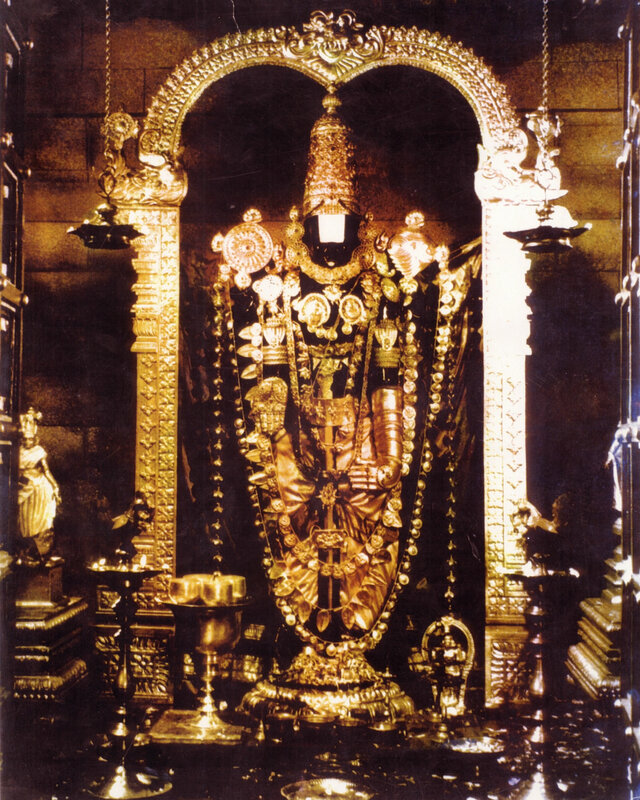 The idol of Venkateshwara wears a gold crown, which has a large emerald embedded on its front. On special occasions, it is replaced with a diamond crown. On the forehead of the idol, two thick white patches of tilak – a mark worn on the forehead – drawn with refined camphor, almost covers the eyes of the idol. The whole idol is decorated with precious ornaments. It bears Goddess Lakshmi on the right chest and Sri Padmavathi Devi on the left. The palm of its raised right hand is embedded with a gem-set Sudarshana Chakra. The slightly outstretched front right hand, has its fingers pointing toward the feet, as if the Lord is the only recourse to his devotees to dissolve in him and enjoy eternal bliss. The lotus feet are covered with gold frames and decked with clinging gold anklets. Suprabhatam (Sanskrit: सुप्रभातम्), literally means auspicious dawn and is a collection of hymns or verses recited in the early morning to awaken the deity in Hinduism. The most well-known Suprabhatam is the Venkateshwara Suprabhatam, which is recited at Tirupati to awaken Venkateshwara. A rendition of the poem by renowned carnatic vocalist M. S. Subbulakshmi is extremely popular and is played daily in many homes and temples of South India. Under the rule of the Vijayanagara emperors was when the temple gained most of its current wealth and size with the donation of diamonds and gold. In 1517 Vijayanagara ruler Sri Krishna Deva Raya, on one of his many visits to the temple, donated gold and jewels, enabling the inner shrine roofing to be gilded. Statues of Sri Krishna Deva Raya and his spouses stand in the premises of the temple. 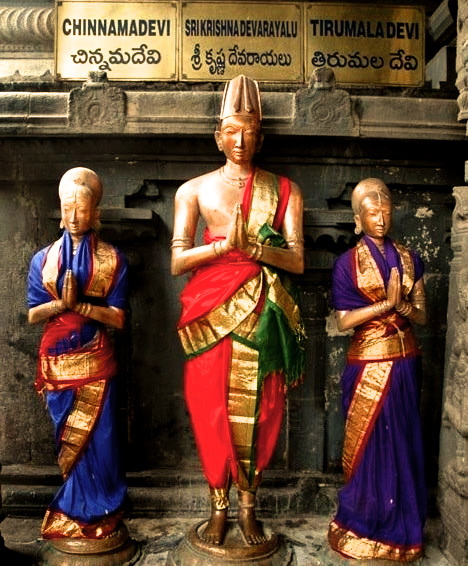 Sri Tallapaka Annamacharya, also called Annamayya (1408 – 1503), was the official songmaster of the Tirumala Venkateshwara Temple, and a Telugu composer, who composed around 36000 keertana songs, many of which were in praise of Venkateshwara. The musical form of the keertana songs that he composed have strongly influenced the structure of Carnatic music compositions, which are still popular among Carnatic music concert artists. He is widely regarded as the Pada-kavita Pitaamaha, the grandfather of song-writing of the Telugu language. In the poems, he praises Venkateshwara, describes his love for him, argues and quarrels with the Lord, confesses the devotee’s failures and apprehensions, and surrenders himself to Venkateshwara. Tarikonda Venkamamba was a poetess and devotee of Lord Venkateshwara in the 18th century. She wrote numerous poems and songs in Telugu. Kakarla Tyagabrahmam (1767 – 1847), was one of the greatest composers of Carnatic music or classical South Indian music. He, along with his contemporaries Muthuswami Dikshitar and Shyama Shastry, forms the Trinity of Carnatic music. Tyagaraja composed thousands of devotional compositions, most of them in praise of Lord Rama. Prasadam is blessed food, that is given out to the devotees. The most famous Tirupati “Laddu” is given at Tirumala Temple as prasadam. Many devotees have their head tonsured as “Mokku”, an offering to God. The hair thus gathered is sold by the temple organisation a few times a year to international buyers for use as hair extensions and in cosmetics. This is the second highest income generating activity in the temple next to the Hundi Collection. Devotees go to Tirupati to donate money in Venkateshwara’s hundi (donation pot) so that he is pleased and grants them their wishes. The donations vary from small rupee amounts to high gold offerings.